Editor/Author Kennedy White, Kim and Duram, Leslie A. 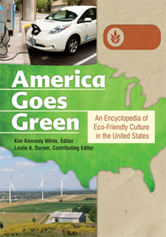 This three-volume encyclopedia explores the evolution of green ideology and eco-friendly practices in contemporary American culture, ranging from the creation of regional and national guidelines for green living to the publication of an increasing number of environmental blogs written from the layperson's perspective. Questions About Your Community: What Can I Do to Help the Environment When I Travel for the Holidays or an Upcoming Meeting?